Australia is no stranger to the bluebottle jellyfish, but what happened last month on the Australian coastline was out of the ordinary! The bluebottle is common visitor to the area, but according to www.weather.com the average number of stings per year is about 10,000 and during this most recent rampage across the coast there have been over 22,000 people seeking medical attention for a bluebottle stink in less than a 60 day period. The bluebottle is commonly referred to as a jellyfish, but it is not actually a jellyfish, but it is actually a colony of organisms called siphonophores. These creatures are bonded for survival and together they are able to survive. Alone these creatures cannot survive on their own. They have a float, which is where the colony received its namesake from because it appears to a blue bottle floating atop of the sea. This float or bottle is actually how most of these creatures move about the ocean. The float is caught by the wind and it takes the bluebottle colony with it. Some scientist believe that this outbreak of bluebottles down under is due to climate change. With stronger winds the wind can pick up and carry more bluebottles to the Australian coastline. Stronger winds and storms have been suggested to be due to global climate change. Does this mean this epidemic of the bluebottle will be an annual occurrence? While many outside of Australia may not have heard of the bluebottle they may have heard of its cousin, the Portuguese Man o’War. While they are similar they are luckily very different as well. The bluebottle is not nearly as venomous as the Man o’War. The bluebottle is also smaller. While being stung by a bluebottle is painful it is rarely deadly, unless you are a fish! 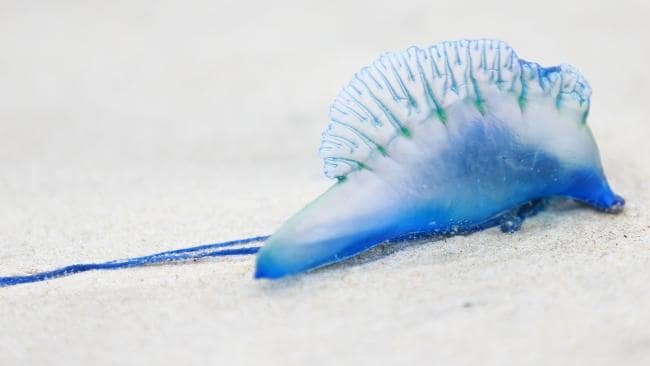 When a victim cannot determine if they have just been stung by a bluebottle or a Portuguese man o’ War it is suggested that they treat it as though it was a sting of the more venomous of the two, but soaking the sting in vinegar. To treat a bluebottle sting it is recommended to rinse with salt water and then apply heat, if heat is not available an ice pack. The pain from the sting should subside within a few hours. In the midst of the Australian summer many beaches are being closed due to the extremely high number of reported bluebottle stings, it has forced many people to change their vacation or weekend getaway plans. While no true numbers are being reported, anytime a beach is closed it will affect the economy around it. Restaurants, hotels, and shops will all feel the subsequent sting from this bluebottle invasion during their peak seasons for tourists. Avoidance is the easiest way to steer clear from the bluebottles at this point. If you don’t go into the water you probably won’t get stung. Pay attention to where you are walking on the beach and other areas. If it looks like a bluebottle it is best to avoid it. If you are set on going into the water, choose beaches that are open and being checked by lifesavers for water safety. They will mark off areas they deem ‘safe’ but if you go in to the water there is a chance you might get stung. Try taking a dip in a local pool instead of the sea and you can cool off in the summer heat and not have to worry about getting stung and having it ruin your weekend or vacation. The bluebottle ‘jellyfish’ invasion on the Australian coast is not unheard of, but it is definitely exceeded its normal expectations. This epidemic of bluebottles has impacted coastal economics because beaches have been forced to close due to patrol safety. During Australia’s hot summer months, they are being asked to not enter the ocean due to the likelihood of being stung. The sting is rarely deadly, but it can definitely ruin your weekend. If you dare to enter the water during this ocean side rampage of bluebottles be aware of your surroundings and if you feel the sting rinse with warm salt water and treat with ice packs if necessary.